Ideally situated just a one minute walk from the Seine River, this recently renovated 2BR 2BA apartment accommodates 6 people and has all the modern amenities and comforts of a Parisian home. 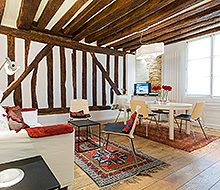 There are exposed wooden beams on the ceiling and exposed stone walls in the living area. 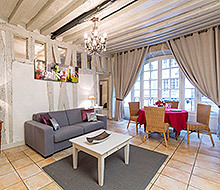 Situated on the ground floor, it faces a beautiful flowered and tree-lined courtyard - the largest in Le Marais. 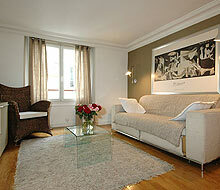 This Apartment is a quiet oasis tucked away on a the charming rue St Paul. The main commerce street, the rue St Antoine, is around the corner. There you will find the metro station St Paul and plenty of shops, restaurants and food stores. Also within a 10 minute walk is the lovely Place des Vosges and the lively Bastille area of Paris. The entrance to the apartment gives onto living and dining area. There is a flat screen TV with cable channels. In addition there is WiFi internet access and an international calling plan. The dining table seats 6 people. The small, but well equipped kitchen (complete with oven, microwave, dishwasher, refrigerator, and Nespresso coffee machine) leads onto the 2 bedrooms. There is a small table in the kitchen to have coffee and petit déjeuner.